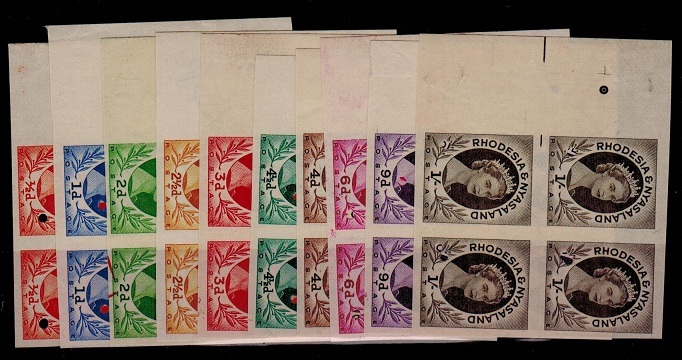 Showing items in category Rhodesia and Nyasaland, sorted by newest listed first. RHODESIA AND NYASALAND - 1956 underpaid cover to USA from LUSAKA with INSUFFICIENT handstamp. 1956 (AU.25.) cover addressed to USA (few light tone marks at edge) bearing 1/3d adhesive of Rhodesia and Nyasaland tied by LUSAKA/NORTHERN RHODESIA cds and struck at left by violet two lined INSUFFICIENTLY PREPAID FOR/TRANSMISSION BY AIRMAIL h/s. 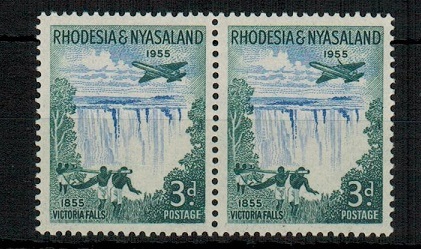 RHODESIA AND NYASALAND - 1955 3d 'DeHavilland' U/M mint pair with WING FLAW. SG 16a. 1955 3d 'DeHavilland' adhesive in a fine unmounted mint pair with one stamp showing the WING FLAW from Row 3/3. SG 16a. 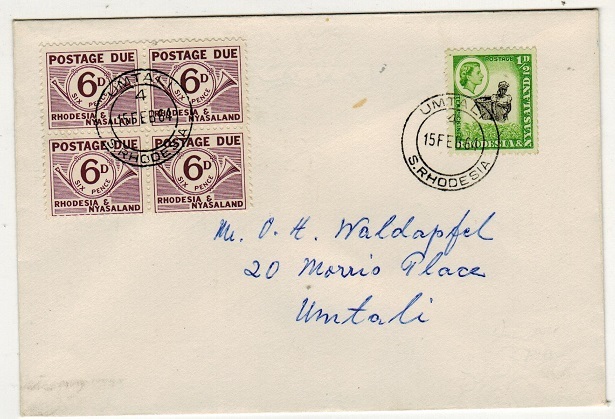 RHODESIA AND NYASALAND - 1964 local cover bearing 6d 'Postage Due' block of four at UMTALI. 1964 (FE.15.) locally addressed cover to Umtali bearing 1/2d 'coil' adhesive (SG 18a) tied by UMTALI d/r cds and with 6d plum 'Postage Due' block of four added (SG D11) additionally struck UMTALI. 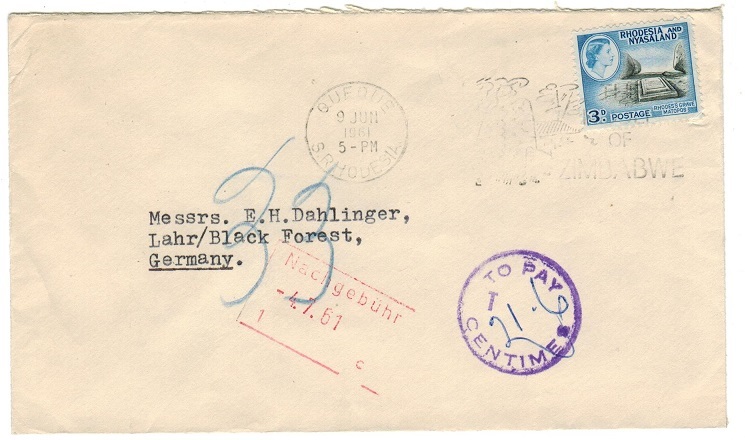 RHODESIA AND NYASALAND - 1956 INSUFFICIENT POSTAGE FOR AIRMAIL cover to USA. 1956 (JU.9.) 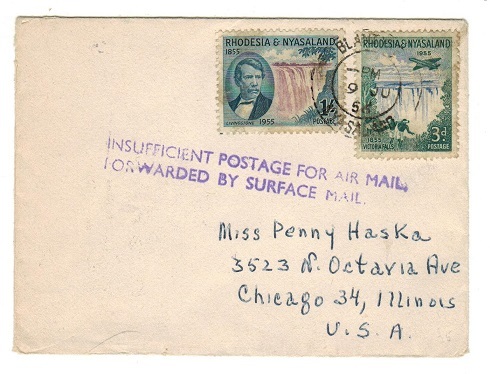 cover to USA bearing 3d and 1/- adhesives tied BLANTYRE/NYASALAND and struck on the front by violet two lined INSUFFICIENT POSTAGE FOR AIR MAIL/ FORWARD BY SURFACE MAIL cachet. RHODESIA AND NYASALAND - 1959 POST OFFICE TELEGRAPHS telegram form used at BULAWAYO. 1959 (JUN.15.) 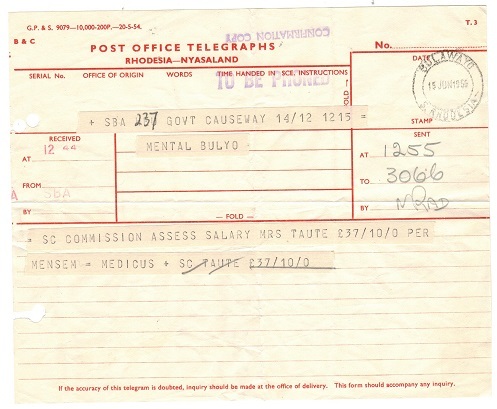 use of red on cream POST OFFICE TELEGRAPHS/RHODESIA-NYASALAND telegram form cancelled by BULAWAYO/S.RHODESIA cds. 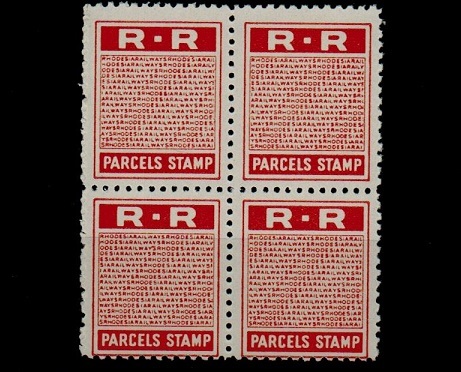 RHODESIA AND NYASALAND - 1960's R.P.PARCEL STAMP 'no value' mint block of four in orange. 1960's 'R.R./PARCEL STAMP' of Rhodesia printed in orange on gummed perforated paper in a fine mint block of four WITHOUT VALUE or station initials. RHODESIA AND NYASALAND - 1961 underpaid cover with TO PAY/T tax handstamp. 1961 (JUN.9.) underpaid cover to Germany bearing 3d adhesive tied by QUEQUE/S.RHODESIA slogan strike with violet circular TO PAY/T/CENTIMES strike applied. RHODESIA AND NYASALAND - 1955 4d RPSE addressed to UK used at KITWE/N.RHODESIA. H&G1a. 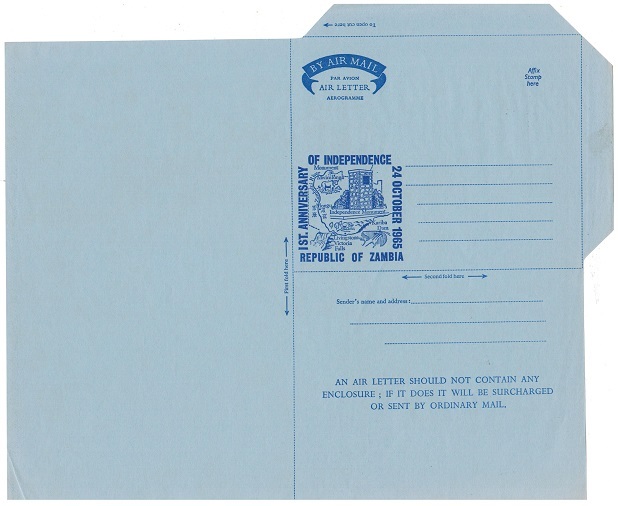 1959 use of 'QEII' 4d blue on cream registered postal stationery envelope (size H2) addressed to UK & bearing additional 2d & 9d strip of five (SG 3+8) tied by KITWE/N.RHODESIA cds. Code slug 7 inserted showing use on counter position number 2. Proud D9. H&G 1a. RHODESIA AND NYASALAND - 1955 4d RPSE to Port Elizabeth used at SOLWEZI. H&G1a. 1956 use of 'QEII' 4d blue on cream registered postal stationery envelope (size H2) addressed to Port Elizabeth & bearing additional 1/2d & 4 1/2d adhesives (SG 1+6) tied by SOLWEZI/ NORTHERN RHODESIA cds. Proud type D5. H&G 1a. RHODESIA AND NYASALAND - 1955 4d RPSE to UK used at MUFULIRA/NORTHERN RHODESIA. H&G 1a. 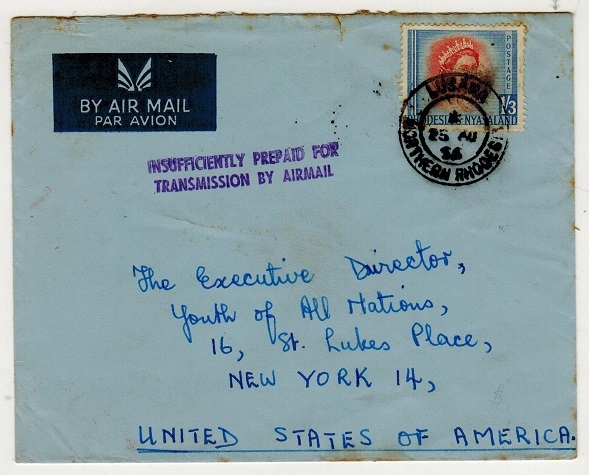 1955 4d ultramarine on cream registered postal stationery envelope (size H2) addressed to UK bearing additional 2d (x2) adhesives tied MUFULIRA/NORTHERN RHODESIA cds dated 29.MAR.55. H&G 1a. RHODESIA AND NYASALAND - 1965 unused air letter with 1st ANNIVERSARY OF INDEPENDENCE illustration. 1965 (circa) dark blue on blue AIR LETTER/AEROGRAMME sheet in unused condition depicting illustration marked 1ST ANNIVERSARY OF INDEPENDENCE-REPUBLIC OF ZAMBIA. Unfolded. RHODESIA & NYASALAND - 1960 first flight cover to France. 1960 (SEP.23.) 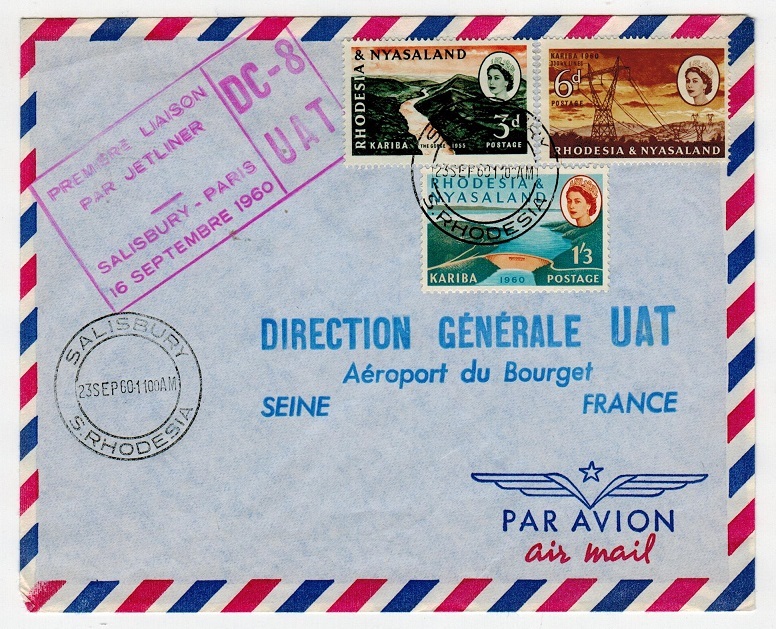 first flight cover addressed to France bearing 3d, 6d and 1/3d adhesives tied by SALISBURY/S.RHODESIA cds with magenta boxed PREIERE LIAISON/PAR JETLINER/ SALISBURY-PARIS/ DC-8 UAT cachet at left. RHODESIA & NYASALAND - 1955 4d RPSE to UK used from CHINGOLA/N.RHODESIA. H&G 1. 1955 4d ultramarine on white registered postal stationery envelope addressed to UK bearing 1d, 2d pair and 1/- adhesives tied by CHINGOLA/NORTHERN RHODESIA cds's dated AP.30.55. H&G 1. RHODESIA + NYASALAND - 1960 (circa) IMPERFORATE PLATE PROOFS of R.R/RAILWAY stamps. 1960 (circa) three R.R./RAILWAY STAMP issue IMPERFORATE PLATE PROOFS printed in green, yellow and pale blue on gummed white paper each having 'blank' type centres. Used for the Rhodesia Railway parcel services. (3 proofs). RHODESIA & NYASALAND -1960 (circa) range of railway parcel SPECIMEN stamps. 1960 (circa) range of rouletted railway parcel stamps in mint marginal strips of three all showing sheet numbers (few minor odd faults) of the S.A.R./PARCEL STAMP issues of 1c,2c,3c,5c,8c, 10c,20c,25,50c, R1 and R2 issues all overprinted in black S/M for specimen. Scarce lot. (33 stamps). RHODESIA AND NYASALAND - 1954 2/- IMPERFORATE PLATE PROOF block of four. 1954 2/- IMPERFORATE PLATE PROOF corner marginal block of four (SG type 2) printed in the issued colours of deep blue and yellow brown printed on gummed paper with small official security punch holes in each. RHODESIA AND NYASALAND - 1954 set of 10 (SG 1-9) in IMPERFORATE PLATE PROOF blocks of four. 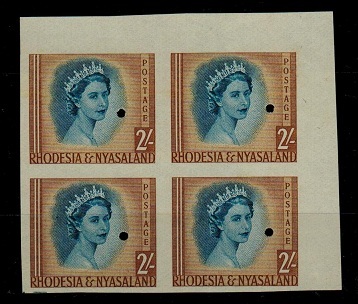 RHODESIA AND NYASALAND - 1955 QEII 4d RPSE unused. H&G 1. 1955 4d ultramarine on cream 'QEII' registered postal stationery envelope (size G) in fine unused condition. Not an easy item to find. H&G 1.